Copyright � 2005 American Geophysical Union. The development of faulting and topography resulting from initial convergence within oceanic lithosphere is largely unknown. 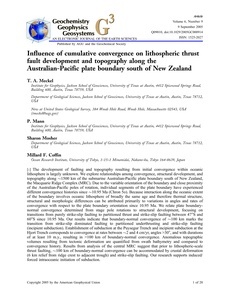 We explore relationships among convergence, structural development, and topography along ∼1500 km of the submarine Australian-Pacific plate boundary south of New Zealand, the Macquarie Ridge Complex (MRC). Due to the variable orientation of the boundary and close proximity of the Australian-Pacific poles of rotation, individual segments of the plate boundary have experienced different convergence histories since ∼10.95 Ma (Chron 5o). Because interaction along the oceanic extent of the boundary involves oceanic lithosphere of broadly the same age and therefore thermal structure, structural and morphologic differences can be attributed primarily to variations in angles and rates of convergence with respect to the plate boundary orientation since 10.95 Ma. We relate plate boundary-normal convergence determined from stage pole rotations to structural development, focusing on transitions from purely strike-slip faulting to partitioned thrust and strike-slip faulting between 47°S and 60°S since 10.95 Ma. Our results indicate that boundary-normal convergence of ∼100 km marks the transition from strike-slip dominated faulting to partitioned underthrusting and strike-slip faulting (incipient subduction). Establishment of subduction at the Puysegur Trench and incipient subduction at the Hjort Trench corresponds to convergence at rates between ∼2 and 4 cm/yr, angles >30°, and with durations of at least 10 m.y., resulting in >100 km of boundary-normal convergence. Anomalous topographic volumes resulting from tectonic deformation are quantified from swath bathymetry and compared to convergence history. Results from analysis of the central MRC suggest that prior to lithospheric-scale thrust faulting, ∼100 km of boundary-normal convergence can be accommodated by crustal deformation (6 km relief from ridge crest to adjacent trough) and strike-slip faulting. Our research supports induced/ forced intraoceanic initiation of subduction. Copyright 2005 by the American Geophysical Union. geodynamics; geomorphology; Macquarie Ridge Complex; oblique convergence; subduction initiation; trench.